METAIRIE, La. 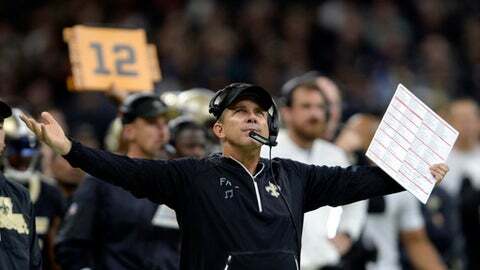 (AP) On paper, it looks as if coach Sean Payton has the Saints rolling once again. They’ve won five straight and enter a second straight week atop the NFC South all by themselves. Then there’s the more complicated, nuanced reality of how the past two games have gone. When the Saints won at Green Bay in Week 7, they didn’t have to play against star quarterback Aaron Rodgers, who hurt his collarbone the week before. In a win over Chicago on Sunday, New Orleans had two pivotal replay reversals go in their favor and also were facing a rookie QB making his fourth start. ”We’re still chasing a perfect four quarters of football as opposed to a good half,” Payton added. What Payton won’t do is apologize for good fortune, such as a reversal of what was initially ruled a fumble by Saints running back Alvin Kamara, or the disputed reversal of what appeared to be a touchdown catch by Bears tight end Zach Miller, who seriously injured his knee as he came down with the ball. ”Our league each week is made up of breaks,” Payton said. ”We can’t control the quarterback (in Green Bay) and quite honestly I thought (officials) missed some calls” to New Orleans’ detriment against Chicago. Regardless of breaks, the improvement of New Orleans’ defense is evident. The unit has closed out the past two victories with interceptions and hasn’t allowed as many as 350 yards in a game during the winning streak after allowing an average of 512.5 yards in New Orleans’ two losses during Weeks 1 and 2. The previous time New Orleans won five straight was 2013, when left tackle Terron Armstead was a rookie reserve. He became a starter later that season, after New Orleans had opened 5-0. The Saints went 7-9 each of the previous three seasons, meaning third-year defensive lineman Tyeler Davison has yet to experience a winning NFL campaign. He said understanding how tough it can be to win consistently in the NFL makes him optimistic about New Orleans’ recent streak. Indeed, the Bears arrived in New Orleans having won two straight, but trailed by two scores for most of Sunday’s 20-12 loss to the Saints. ”As long as we keep being objective about what we see, I feel like we’ll be good,” Davison said. NOTES: CB Delvin Breaux, a starter when healthy the past two seasons, is eligible to come off injured reserve this week and said he feels ready to do so. ”I’m great. I’m there. I practiced full last week,” said Breaux, who had surgery in August for a fibula fracture. However, Payton said the Saints won’t rush Breaux back, comparing his situation to that of receiver Willie Snead, who has seen minimal action since returning from an early season suspension. ”I don’t think you just flip the switch and then bang,” Payton said. … Bush, who was in coverage when Miller’s knee gave out Sunday, said it was upsetting to learn about the seriousness of the tight end’s injury, which required immediate surgery at a hospital. ”I’m praying for him and his family and I’m praying that he has a speedy recovery,” Bush said.